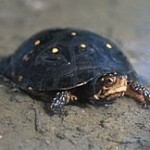 The spotted turtles are among the only ones that are left of the genus named Clemmys of the turtle family. It is more popularly found in various regions of USA. They are almost harmless in nature and can become very friendly pets. The females store the sperms for more than 5 years in order to give birth to a healthy baby. The karyotypes of these species have about 50 chromosomes. The adult turtles consist of 100 spots all over their body. 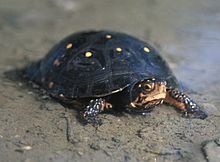 Size of Spotted Turtle: In these species, the males are smaller than the females. The spotted turtle also consist of a carapace. In adults, the length of the shell varies from 3.1 to 4.7 inches. Color of Spotted Turtle: The shell of these turtles is generally black colored with spotted by bright yellow spots. The males bear lesser spots than those on females. The color of the skin of these species varies between grey and Black. Alike the body, the head and limps are also adorned with yellow colored marks. The lower portion is commonly found in pink, yellow or reddish color. Carapace of Spotted Turtle: The upper portion of the shells of these species reflects a polished appearance. Even the upper portion of the shell is not bifurcated with ridges. 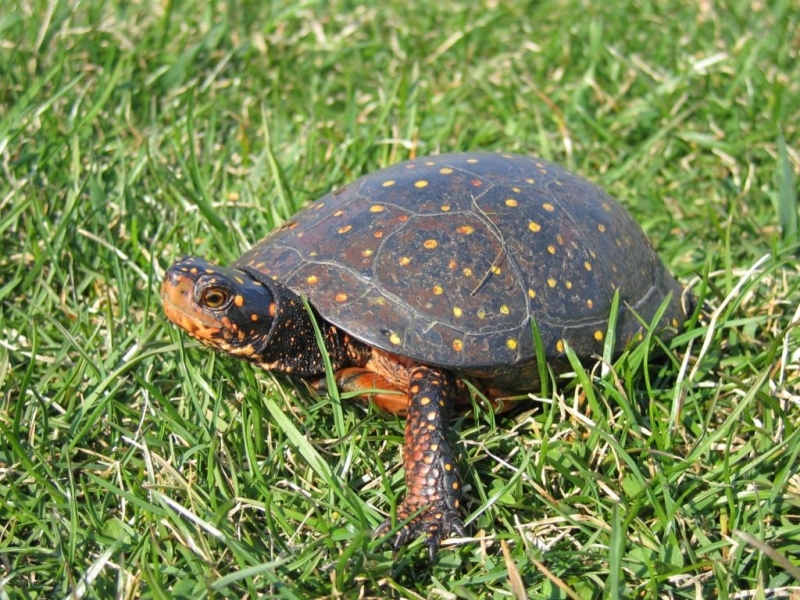 Plastron of spotted Turtle: The color of the lower portion of the shell is majorly yellow and orange yellow and it is also dotted with black marks, quite the reverse of the visible portion of the shell. However, as the turtle becomes adult, the whole shell gets black colored. In case of males, the shells are concave while females have flat shells. 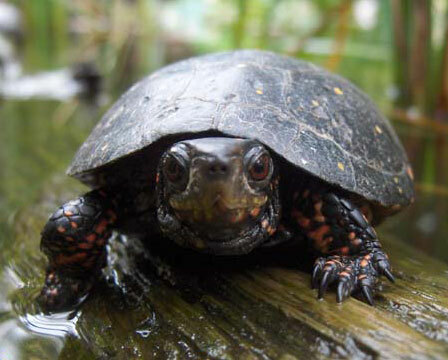 Head of the spotted Turtle: These species bear black colored head with yellow spots. The females consist of orange eyes and a yellow chin, while the males have brown eyes and a dark chin. 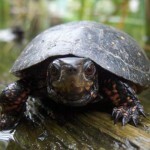 Tails of the spotted Turtle: These species of the turtle have a flat and short tail. In addition to this, the tails are dotted with yellow marks and stripes. As compared to males, females have a shorter tail. A glimpse of these beautiful species can be easily caught in parts of USA and Canada. They can be spotted fairly well also in parts of Florida and Southern Ontario. They are also sparingly inhabit parts of Pennsylvania, Georgia, Ohio, Delaware, and New Jersey. The Spotted Turtles are omnivorous. They prefer to feed on green algae and aquatic vegetation. They also like to have larvae, worms, spiders, crustaceans, tadpoles & small fishes in their diet. These species hardly move about during the periods of harsh winter and strong summers. In Northern parts, these species get active only during the period of April and May. 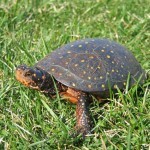 During the winter and summer, the spotted turtles hibernate inside the water bodies or on a ground surface. These species actively take part in underwater hunting. However, they also wander on the land in search of food. The females are found to me more active and mobile during the evenings. Whenever these species sense their predators, they hop in to the water or hide inside the mud. The spotted turtle lives partly on land and water hence brackish areas accompanied with tides. They also like to dwell on bogs, fens, swamps, marshes and streams. The shells of these species fortify them from their enemies. One of the most outstanding features of these turtles is that they have the ability to camouflage. The concave shell of the males helps them during the mating season. These species usually have their mating season in the periods of March and May. They prefer to mate under water areas. These species achieve sexual maturity between the ages of 7 – 10 years. In a quest of the perfect nest the females usually travel far distances. The female counterparts prefer meadows, fields and roads for living. With the help of their legs, they dig a pit of 2.5 by 2 inches. After that, they lay about 3 – 6 eggs in the pit. The eggs are oval with thin shells. The mother wraps them with a layer of mud after laying the eggs. The eggs of these species take nearly 11 weeks to hatch. As soon as the baby turtles are born, they stroll about in quest of food and shelter. Those born at low temperatures are males and those born in warm regions are born as females. The Spotted Turtle hibernates during periods of extreme cold or hot. The spotted turtle do prefer to hibernate in lodges, burrows or in the shallow waters. These species live for up to 25 – 50 years of age. These species of the turtle family are easy to pet. They are very serene and they do not require much maintenance. However, one needs to abide by the laws as these are enlisted in the category of rare species. Housing Required: One should arrange a tank, which can hold at least 35 gallons of water. One-half of the tanks should be filled with water and the remaining portion should be land. There should also be a presence of woods. Temperature Necessary: The temperature of the water should normally be 75 to 85 degree while the temperature for basking should be 82 to 86 Fahrenheit. Lighting Required: One should provide enough lighting, in order to supplement their proper growth. Foods Required: One can give them fishes, small mice and insects to eat for all supplementary requirements. According to IUCN, the lives of these species are gravely threatened.